Pick up thinking cap, pick upIn the Beginning Was the Word . If you put down your thinking cap, then you might as well put down this book because very little of it is going to make it's way inside of you otherwise. This book is detailed, thought-filled and mildly exhausting to read. And yet! 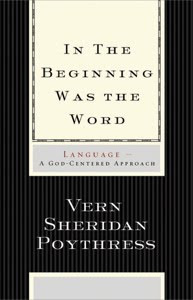 The main point of this book can be summarized in the subtitle: "Language -- A God-Centered Approach." I feel like I will not even come close to doing this book justice in my challenge to write up a review of it. The main point I walked away from in reading this book is that God is even bigger than I realized. He's bigger. He is the beginning, the end and everything in between. He is the only reason I can understand you and you can understand me because He created the means by which and through which we can communicate! (And still, sometimes we fail miserably with the help of the gift of words we've been given! Bah!) We, who were made in the image of God, are given the gift of speech so that we can "mimic" Him in taking control of, giving things meaning and establishing presence. These are big thoughts! As a result of God being a personal God, He communicates through speech we can understand. He allows us to know Him through speech (among other ways) and He allows us to speak back and communicate with Him. He has relationship with us, in part, through language which He made for us to understand (and He therefore cares about how it is developed and used). Not only does He know our language (English, the language which you are no doubt reading this post!) but He also knows and understands a hundred different languages and dialects across the globe and has His hand in all of them. I guarantee you that, if you want to know God in a deeper more impacting way, this is a worthy book. If you just need Him to show Himself to you in such a way as will make Him bigger to you, then this book might help you. There is nothing so small that God does not care about it. Everything has meaning and, I would argue, especially the words that we use to choose to communicate truth to one another. Let me assure you that this book is about so much more than the few things I have described here. At the moment, it's all that my little mind can grab hold of. He really does communicate with us with language, huh? This sounds really good. Not sure I have the mental energy right now to tackle it, but it's going on my "to read" list.